Keota Fields, "Berkeley: Ideas, Immateralism, and Objective Presence"
Berkeley: Ideas, Immaterialism, and Objective Presence offers a novel interpretation of the arc of George Berkeley's philosophical thought, from his theory of vision through his immaterialism and finally to his proof of God's existence. Keota Fields unifies these themes to focus on Berkeley's use of the Cartesian doctrine of objective presence, which demands causal explanations of the content of ideas. This is particularly so with respect to Berkeley's arguments for immaterialism. One of those arguments is typically read as a straightforward transitivity argument. After identifying material bodies with sensible objects, and the latter with ideas of sense, Berkeley concludes that putative material bodies are actually identical to collections of ideas of sense. George Pappas has recently defended an alternative reading that grounds Berkeley's immaterialism in his rejection of what Pappas calls category-transcendent abstract ideas: abstract ideas of beings, entia, or existence. Fields uses Pappas's interpretation as a framework for understanding Berkeley's immaterialism in terms of transcendental arguments. Early moderns routinely used the doctrine of objective presence to justify transcendental arguments for the existence of material substance. The claim was that physical qualities are necessary for any causal explanation of the content of sensory ideas; since those qualities are represented to perceivers as ontologically dependent, material substance is the necessary condition for the existence of physical qualities and a fortiori any causal explanation of the content of sensory ideas. On the reading defended here, Berkeley rejects Locke's transcendental argument for the existence of material substratum on the grounds that it turns decisively on the aforementioned category-transcendent abstract ideas, which Berkeley rejects as logically inconsistent. 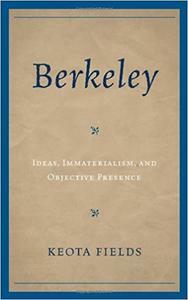 In its place, Berkeley offers his own transcendental argument designed to show that only minds and ideas exist. He uses that argument as a proof of God's existence-and ultimately to argue that the emergence of meaning from a material world simply cannot be explained. A portrait emerges of a thinker deeply engaged with the theories of his time, yet one who is captivated by the question of how meaning arises in the world. Students and scholars of the history of philosophy, particularly early modern history and the British Empiricists, will find this book to be a valuable addition to their collections. Berkeley: Ideas, Immateralism, and Objective Presence Fast Download via Rapidshare Hotfile Fileserve Filesonic Megaupload, Berkeley: Ideas, Immateralism, and Objective Presence Torrents and Emule Download or anything related.